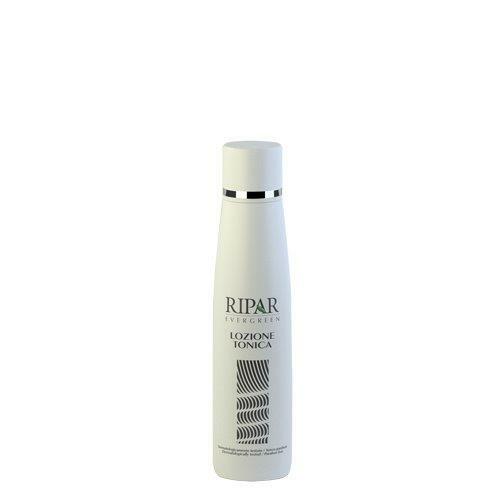 Ripar Evergreen Toning Lotion is a mixture of distilled waters (calendula, cornflower and mallow) with hydrating and toning properties. This tonic is ideal for the eyelids and the area around the eyes, one of the most sensitive of the entire face. Thanks to its formula with floral extracts, acts as a decongestant that soothes redness and reduces enlarged pores, giving a pleasant feeling of freshness and well-being for all skin types. It tones the skin and prepares it for make up. It is also appreciated by man after shaving. Use the Toning Lotion to complete the cleaning of the face after applying Ripar Evergreen Cleansing Milk or aftermask removal. Use a cotton pad soaked in Lotion on the face and neck. You can also tap gently on the skin with your fingers to help absorption.